PISTOL GRIP CUTTERS give your fingers a rest by transferring the pressure from your fingers to your palm. Best choice for those with arthritis or for those who spend a lot of time cutting. 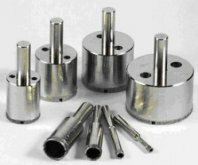 All have carbide wheels, replaceable cutter heads and oil feed. The pistol grip with carbide wheel and the lowest cost. We sell hundreds of these cutters! Finest quality pistol grip cutter with long lasting carbide tap wheel. The patented Tap Wheel allows you to score with less pressure and it gives you cleaner cuts. Available in blue, purple (shown), green or hot yellow. Random color will be sent. This cutter has been designed to cut THICK glass. Use for plate glass or glass tiles from 1/4 to 3/4" thick. The special Tap Wheel applies a deeper score, giving a cleaner edge. 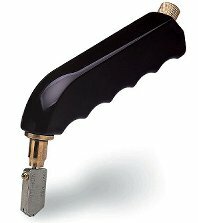 Many glass fusers use this cutter when trimming fused blanks or cutting strips for re-fusing. Our most popular Supercutter. Triangular shaped barrel grip is easy on your fingers and allows you to apply pressure with out an increase in fatigue. Available in hot red, hot orange, blue, purple, green (shown) or hot yellow. Random color will be sent unless you request a specific color. The heavy duty brass barrel will last a lifetime. We find that this cutter is most popular among men as the heft and weight gives this cutter the feel of a "real tool". SPECIAL GRIP CUTTERS are alternatives to the more standard styles above. palm. Best choice for those with arthritis or for those who spend a lot of time cutting. All have carbide wheels, replaceable cutter heads and oil feed. The tapered and molded barrel fits all hands and can be gripped in a traditional style or like a pencil. Palm rest can be configured in four different ways to fit all sizes of hands. Comes with the Tap Wheel cutting head. The Tap Wheel head is a revolutionary cutting head that "taps" your glass as you score, producing a deeper score with less pressure. This is probably the most compact carbide cutter. The curved saddle at the top of the cutter fits neatly between your thumb and forefinger. Gives great control and saddle makes applying pressure very easy. REPLACEMENT HEADS give you a brand new cutter. Quick and easy replacement. Be sure to order the correct head for your cutter. Cutters above come with the "small" head as it is easier to see your score line when free-hand cutting. The "large" head is used when you will be cutting against a straight edge most of the time. The broader surface makes it easier to follow along the edge of a straight edge or square. Original head on most of the Toyo cutters above. Option preferred by those who will be cutting a lot of straight lines. Works on all Toyo cutters above except Custom Grip. The wider head follows a straightedge with more accuracy. Original equipment on the #0860-V Toyo cutters above. Option preferred by those who will be cutting a lot of straight lines. Original equipment on the Toyo Custom Grip cutter. Original equipment on the Toyo Black Handle Pistol Grip cutter. Original equipment on the Bargain Cutters above. Fletcher-Terry is the originator of the wheel type glass cutter. 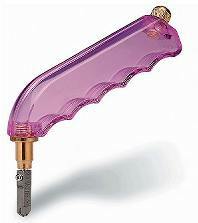 Fletcher has remained a leading name in glass cutting. Stick Handle Cutters are inexpensive choices. An ideal choice for someone just starting out. Reasonable quality at a low price. These cutters will generally last through several projects. FLETCHER #01-128 (#08521) has a die-cast metal handle which is lighter and more comfortable to hold. The 114° cutting wheel is made for hard surfaced glass such as opalescent glass. The most popular steel wheel cutter! With ball end and BLUE band. FLETCHER #01-131 (#08541) has a smaller wheel, with a 122° hone. Used for cutting smaller, odd-shaped pieces as the small wheel goes around curves easy. Straight handle with GREEN band. last up to 10 times longer than steel wheel cutters above. Both styles have 114° (sharp honed) wheels for use with stained glass. Popular with many teachers as they last much longer than steel wheel cutters and carry a moderate price tag. With silver bands. FLETCHER CARBIDE CUTTER, LARGE WHEEL (#08551) features their comfortable die cast handle. With large wheel for general straight line cutting. This is Fletcher's #01-216 (replaces #CA-7). Straight handle, no ball end (upper left illustration). FLETCHER CARBIDE CUTTER, SMALL WHEEL (#0857) Fletcher #CA-96, for smaller or curved pieces. With ball end handle (lower right illustration). MacInnes Cutters have been around for a long, long time. Decades. And chances are you never heard of them before. But they are known by insiders as some of the finest cutters ever made. CLICK HERE to see the entire MacInnes story and to buy your own legend. Include strip/circle cutters, circle/oval cutters, bottle cutters and more. Morton Helpers: Zinc Miter, Glass Caddy, Assembly Tray and more! From tiny 1mm drills to 2" drills, we have them.